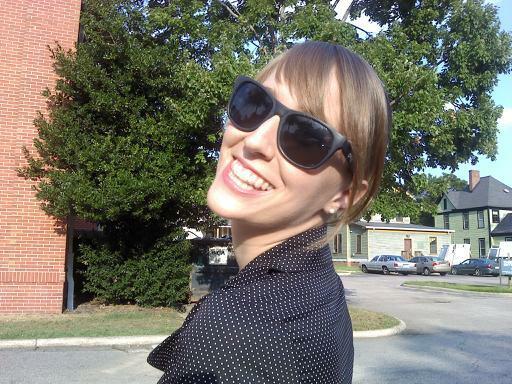 The Broke and the Bookish : Get to Know Paula! Hello everyone! So I was out of town during the blogoversary and I missed the "get to know" interviews. I have been pretty bummed about it because I feel like you guys don't know me that well. And that's sad, because hey let's be friends okay? I have really enjoyed working on this blog and plan on contributing to it more often. So here's Paula 101: I'm Paula. I'm 22. I graduated from UNCW in May. I am still (sadly) looking for a job. I have a really cute dog named Pogo who is the love of my life. A boyfriend exists as well. Besides reading my hobbies include sewing and music (guitar and piano - although I have slacking on playing those recently. whoops) I love Wonder Woman and Velociraptors. 1. What were some of your favorite books as a child? Well the first books I really remember reading were The Adventures of Frog and Toad. I also loved anything by Roald Dahl (especially The BFG and Fantastic Mr. Fox). Oh! and The Phantom Tollbooth which is still one of my absolute favorites. That book should be read continually throughout life because it has so many good things to say. I wrote about this quote in a previous post. And it remains how I feel about books and how I feel about reading. I can't put a book down. Even if it is awful - I will see it through until the end. This quote just sums up my feelings quite perfectly. 3. What do your bookshelves look like and how do you organize them? 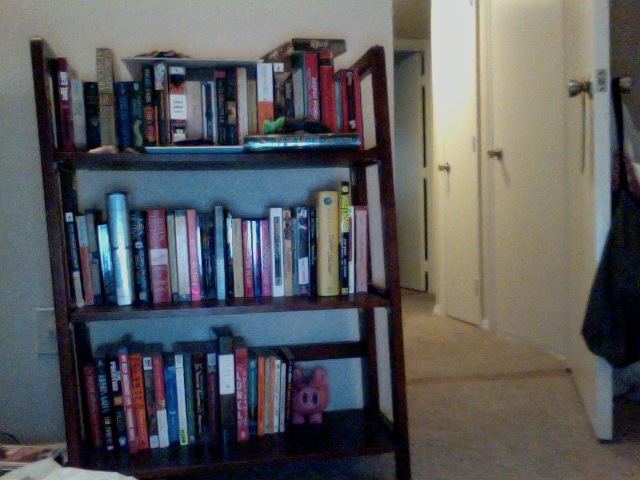 Here are my two lovely book shelves. 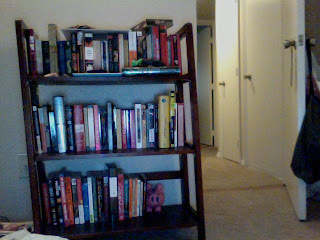 The tall one is my "books I've read" shelf and the small one is my "to-read" shelf. They are organized alphabetically by book and author. I really wanted organize them by color because it would be pretty - but it would be inconvenient when trying to find a book later on. 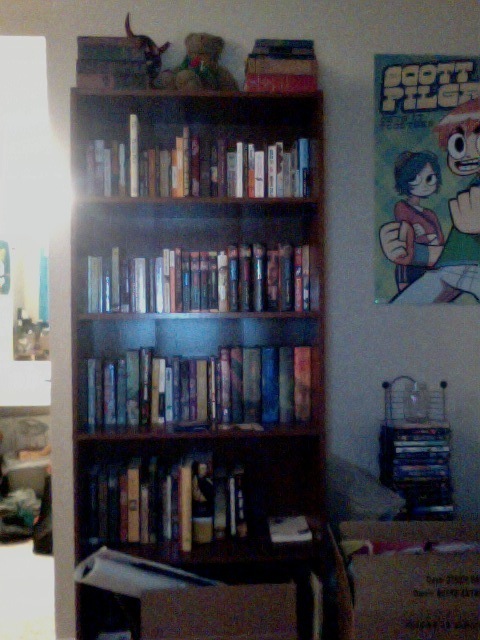 Also note how sad and slanted my to-read shelf is. It started doing that when I moved and I don't know how to fix it! 4. What is the one book you push everybody to read? How about what are the books you push people to read? Well! Brave Story by Miyuki Miyabe which is about this boy whose family is falling apart. So he escapes into a world called Vision which is filled with wonderful creatures and adventure. He has to collect 5 gem stones to be granted one wish. The Book of Lost Things by John Connolly. Another book where a kid finds there way into a crazy world. In this book a little boy finds that the books on his shelf are whispering to him and they lead him into a world of fairy tales - but they are not the fairy tales we knew growing up - they are much darker versions. I love this book with all my heart and I'm saddened that not many of his books are similar in style (read: they are pretty much all crime thriller dad fiction which is not my cup of tea) However, The Gates is also great and you should read that too. The Fourth Hand by John Irving. This is my 55th book this year. 20 away from my goal! phewy. More things to say about me? 2. Margaret Atwood and I have the same last name. It is my one wish that we are some how distantly related. Margaret PLEASE be my 3rd cousin twice removed or something crazy like that. 3. I plan my Halloween outfits about a year in advance. Last Halloween I was Wonder Woman. I plan on being Harley Quinn this year (Ahh have to start that costume!) and I'm already thinking about next year's costume - either Maleficent or if I can get a group together- A Clockwork Orange. 4......? I can't think of anything else very interesting about myself without it being Favorite TV shows or Movies kind of thing. So I'll leave it at that. I hope you guys feel like you know me a bit better? Feel free to ask me any questions. Can't wait to get to know you guys too! I love reading getting to know you posts! It's always fun to meet a book person that also sews. :) When I tell people my hobbies I sound like a 90 year old, haha. I love your costume! Cute picture Paula! Go Wilmington! That's a nice town, my grandmother lives in that area. Now I don't know...some of those books with the cotton rag feeling pages might be good for fiber =P My aunt had suggested The Fourth Hand to me a while ago, she really liked it too. I really need to break open my copy. Sarah - let me what you think of Fourth Hand - I ended up giving it 3 stars. Not my favorite Irving book at this point. Have you ever read John Irving's 'A Widow for One Year'? It is the only John Irving novel I really liked.